The complex will be repairing the seawall starting End of June 2018 through approximately Sept.- October 2018. Expect heavy construction to be active between May and September. *The seawall repair will most likely be loud work with heavy machinery. Work hours are Monday-Friday 8am-5pm but heavy/loud work will not begin until after 9am. Part of the parking lot will be blocked off as well, but that should not pose a parking problem other than you may have to walk farther to the apartment. The pool may or may not be off limits around June/July. Aloha! 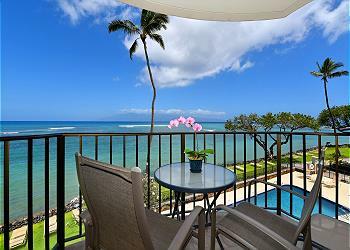 Come enjoy the breathtaking views from the lanai of Kahana Reef #303!! This condo offers fantastic views of Maui’s sister islands of Lanai and Molokai, beautiful sunsets, and sea life such as Giant Hawaiian Green Sea Turtles, Dolphins, and in the winter season Humpback Whales! You are so close to the ocean you could toss a stone into it. The location is perfect for access to all the activities Maui has to offer, or sit back relax and enjoy the peace and quiet. You will love this third floor 1 bedroom, 1 bathroom unit that comes with a fully equipped kitchen, a king-size bed, and a very private lanai with direct unobstructed oceanfront views! There is cable TV, free wireless internet, brand new refrigerator, counter top appliances, ceiling fans, extra fans, hair dryer, iron and ironing board. There is no AC allowed in this building, but it is rarely needed in this area of the island because of constant trade wind breezes!! You can't beat this increible location! Situated on the gorgeous north west coast of the Maui, you are minutes away from the Kaanapali Beach Resort area to the south, and also minutes away the Kapalua Resort area to the north, along with Napili, Kapalua and Honolua bays. These areas host some of the best beaches, snorkeling, golf, restaurants and shopping on the entire island! Aloha! We can't wait to see you here on Maui, The Valley Isle! !